Elena Galvez is 90 years old and lives alone with her hens in the dusty rural suburb of Cerrillos in Chile. With poverty rife in the neighborhood, she collects eggs and whatever she can muster from her cows and rides on her bicycle to sell them. Galvez's mode of transport is her sturdy old bike. Since she was 47 years old, she has turned heads in her small farm community by riding into urban areas to sell produce. Galvez said she is at ease pedaling away. "Without my bicycle, I have no life," she added. 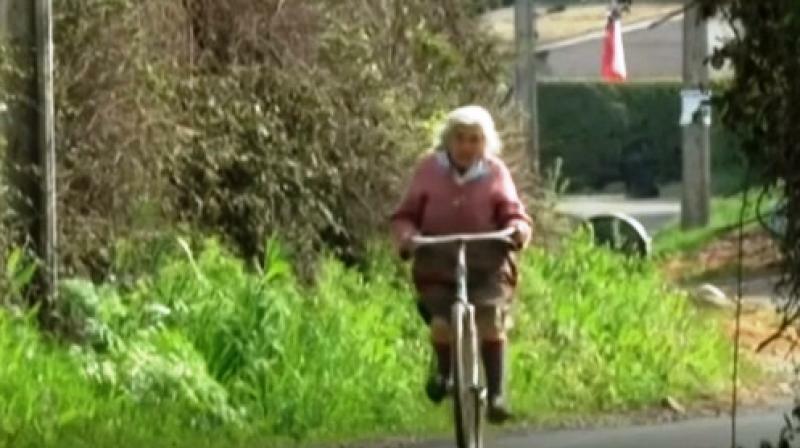 Galvez said her secret to her health and longevity is the old-fashioned bike. Galvez considers her neighbors family, and the love is mutual. "It's a treasure. At her age, having her in Cerrillos, with her activity, with what she says," said neighbor Arturo Pinto. "She's a woman who's excellent to have in town." Galvez said she wouldn't be able to pull off what she does without her trusty bike. "It's my compadre, my friend," she said.